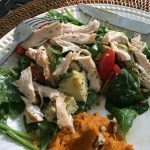 90 Day Challenge: Day 3 | Kay Rice, M.Ed. Thanks to Nutpods coffee is a lot better than I’d hoped it would be with just plain coconut milk. Yesterday I tried the Original Flavor and today I tried their Vanilla flavored coffee creamer. Frankly, without any sweeteners, the vanilla wasn’t bad, but I liked the original flavor that I had yesterday better. 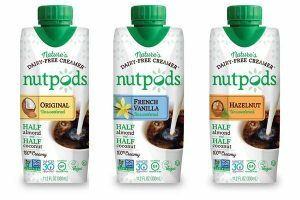 Thanks to a coffee loving reader who posted a comment to ask a question, I went ahead and wrote a review on Nutpods—what is in them and where you can find them. If you are interested, read my Nutpods Product Review. The weather was divine this morning; 75 degrees with a soft breeze blowing. I enjoyed both my morning coffee and my breakfast out back on the screened porch. Breakfast was simple and quick to make. 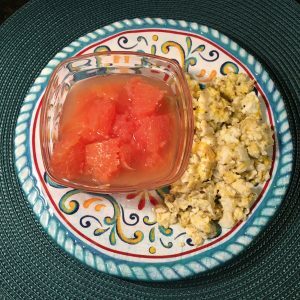 I had a grapefruit in the refrigerator that needed to be used, & some scrambled eggs with oregano added. (one whole egg and 3 egg whites). By the way, if you get a chance to get some farm fresh eggs from chickens that were raised cage free without hormones or antibiotics, notice the yolk. The yolks in the farm eggs are generally a darker, richer color of orange (instead of yellow in most store bought eggs), and I think the flavor is slightly better. I was spoiled with “good eggs” when I lived in Peru. I ate them every day to make certain I got adequate protein. Can you tell who/what is in this photo to the right? This is why I don’t need pets here. I have so many creatures all around. 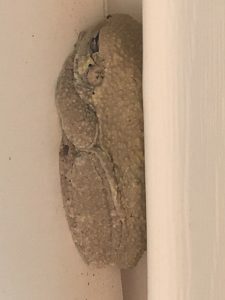 This is a little tree frog resting next the the frame by the garage. I have lizards all around, and one in particular likes to rest between the handrail and the screen just outside the porch. I watch the hummingbirds come and go, and I’ve seen two deer in just the past few days. Could Lunch Be Any Easier Than This? I realized that I had a coaching call right about the time for my next meal. 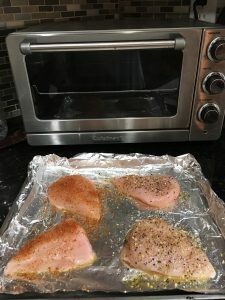 So, a little before the call I popped these 4 Chicken Breasts in my toaster oven. Two of them were seasoned with lemon pepper and the other two with Trader Joe’s Chili Lime seasoning. 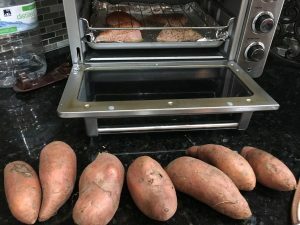 When those came out I put some sweet potatoes in to bake, which were finished by the time my coaching session was done. 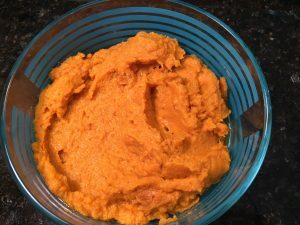 I removed the skins from the sweet potatoes and whipped them, adding some pumpkin pie spice. Servings for several meals! Most protein servings are abut the size of one to 2 palms. 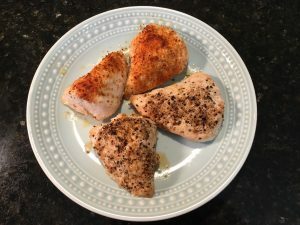 For me, a woman who is not very active right now (and even when I start working out again) and wanting to lose weight about 3.5 ounces of chicken is right for me as a protein portion. You can use kitchen scales, which I advise in the beginning when you are working on getting portion sizes correct. 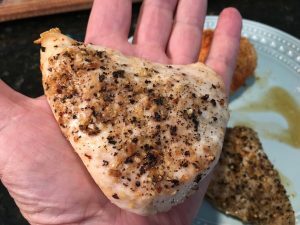 Once you get an eye for what the correct portions look like you don’t have to continue to weigh and measure, except from time-to-time when you want to make sure you are still accurately estimating. 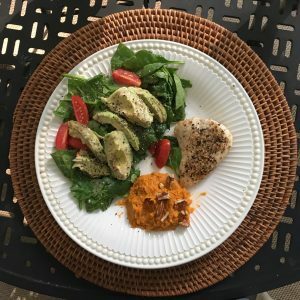 I used one of the lemon pepper seasoned chicken breasts and some whipped sweet potatoes. I decided to add a salad made with some baby spinach & about 4 grape tomatoes and tossed them with Primal Kitchen’s Ranch Dressing. A few avocado slices on top and I retired to the porch again for dinner. I have enough chicken for three more meals and also the sweet potato puree, which wad delicious and sweet even with no sweetener. 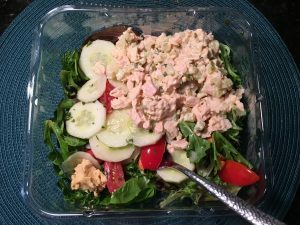 Ha ha, I changed my mind on the chicken breast and decided I wanted to make it part of the chicken salad instead … so I shredded it and tossed it on top and made a salad. Then I ate my sweet potatoes like a desert! Okay, the chicken breasts and sweet potatoes took some time to cook in the toaster oven. I like to use the toaster oven when I can during the summer because it preheats faster and doesn’t heat up the kitchen like the regular oven does. It only took me about 3 minutes to prepare and pop the chicken & potatoes in the oven. Aside from that, none of these meals took more than five minutes to prepare. I like to cook in bulk because I don’t really like spending a lot of time in the kitchen preparing meals and cleaning up. 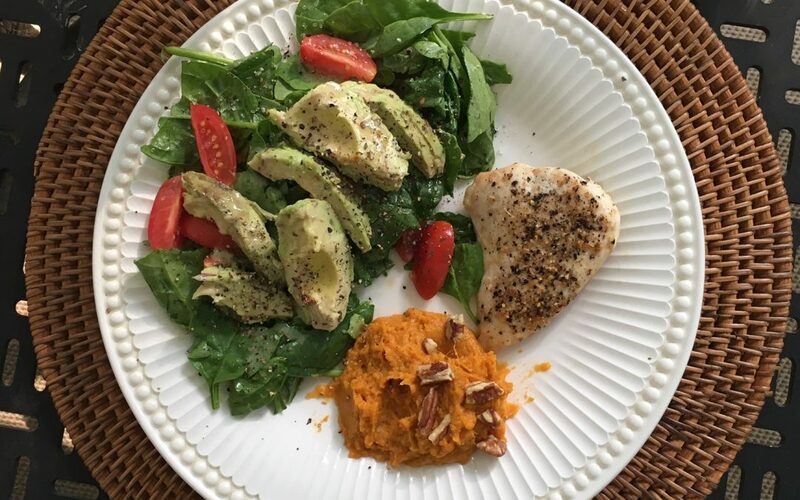 When I cook, I like to make extra so when it is time to eat, I can put a meal together quickly and easily. I cook this way once maybe twice a week. I’m a little more flexible now, but I used to always make Sunday a “cook day”. Everything was prepared in advance and ready in the fridge or frozen for later, and I only have to clean up once for several meals. 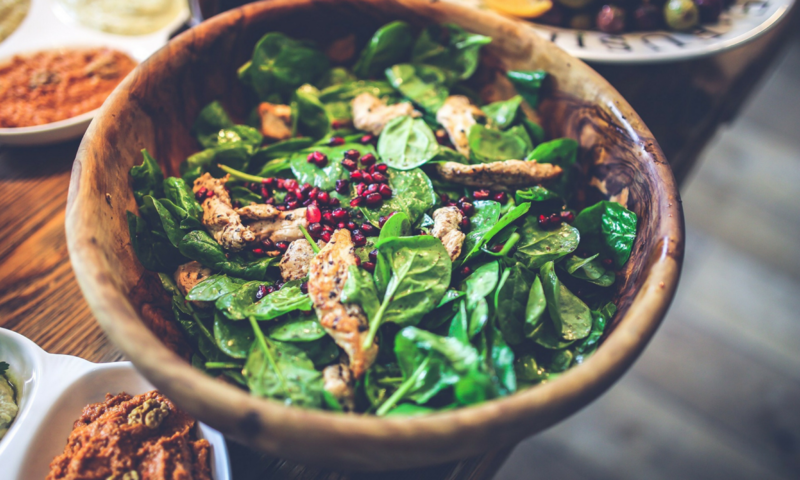 If healthy choices are always quickly ready and available, it make it a lot easier to make a good choice when it is time to eat and you are hungry! Okay, no grains, no legumes, no dairy and no sugar … and you can see that I’m definitely not being deprived! Seriously, I haven’t even gotten very creative yet with my cooking! Part of that is the time of year. I like things cool and quick in the summer. Winter months I love soups, winter squash, and using the crock pot for cooking. Still having to take it easy. I did manage to take a ladder out and paint that sign post, and in the evening I walked further than I’ve been able to in more than a week. That’s progress! I also did some stretching both last night before bed time and today. I’m making sure that every single hour I get up and move. Compared to the workouts I’ve done in the past, all that doesn’t even count as exercise, but right now all movement is good! If it continues to improve, I’m planning a road trip as soon as this weekend to Yogaville, which is about three hours away from me. It’s been on my list of places to check out for a while. However, when I go to Yogaville it would be nice if I could do some yoga and not just hobble around the place, ya know? We’ll see. Water & Supplements: Made both my goals for the day. Sleep: Well that’s been an issue for the past few nights due to pain. When you are trying to up-level your fitness and energy and drop some fat, getting a good night’s sleep is important. Without rest your body holds onto water weight, produces more of a stress hormone called Cortisol (which makes you want comfort foods), and just doesn’t want to release fat. I’m having less pain today, I’m doing my best. I’ve been in bed by 10:00 even if it was to read for a while, and up by 6:00 am or shortly after. I know I’m doing the right things to move myself back in the right direction towards health and being able to resume my normal activity. There are lessons here. We all have setbacks sometime. What matters is that we keep doing our best and paying attention to the messages from our body, and keep doing the things that we can do to move back to health. Our body’s are always changing, healing, and doing their best to support us! I’m ready for tomorrow! Excited because I have a new desk chair coming thanks to Amazon Prime … (self care) I needed to be more comfortable while I’m working, and I have a “to-do” list of things that I’m excited to jump into! I’m having fun with this challenge, and I expect it to only get better. I’m working with someone to help me with the best strategies for getting new resources on-line and available. If that’s not done by Friday, I’m staying here until I finish and Yogaville will have to wait! Please post your comments, questions or any challenges you are having below. I love hearing from you and getting your feedback!